My favorite costumes for Halloween are homemade, unique and free. My daughters costume for a Halloween party this past week ticked all three of those boxes. She was a Headless Hippie. I had seen a bunch of cute headless costumes on Pinterest and I thought they looked complicated, but, in fact, it was pretty simple. And totally free. Win win. 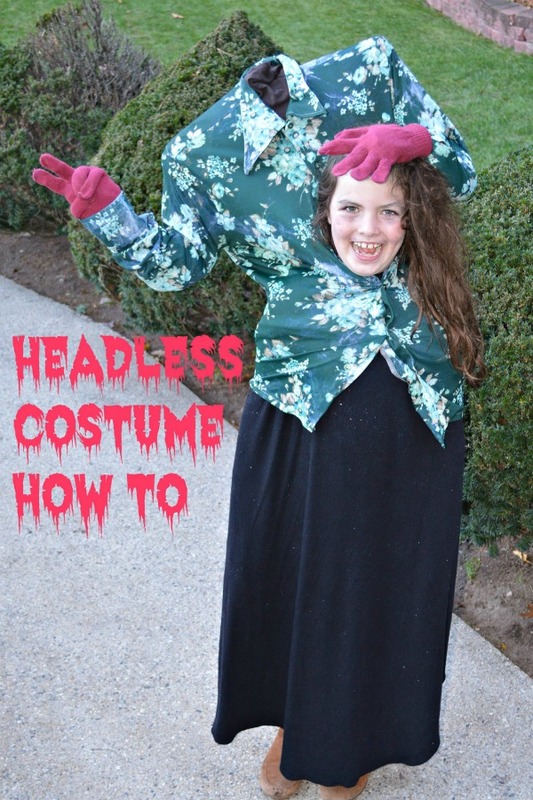 Here’s my Headless Costume How To. The cardboard I used is an old presentation board of my daughters. It fit the bill, although it could have been taller. I’ll tell you how I rectified that coming up. That’s my snazzy duct tape attaching the hanger to the cardboard. Make sure you bend the hook of the hanger down so you can’t see it when you put the torsos shirt on. Step 3: Give you torso some life. Stuff the arms and some of the shoulders with some plastic grocery bags. This will fill out the arms a bit, but you want them to be a little maneuverable, too. This is where the other two wire hangers come. Untwist the wire hangers so they are long wires and then fold them in half so that they are sort of arms length and then feed them into each of the arms. I ended up sticking mine to the cardboard with some duct tape, to keep them in place. Step 4: I’ve seen two schools of thought on what the arms should do. Some people have the two arms holding the head by, like, the ear area and others had one hand holding the head by the hair. That’s what I was going for. I wanted a hippie theme, so I wanted one hand giving a peace sign and the other holding the head by the hair. Positioning the arms takes creativity and trial and error. I used a bunch of duct tape to hold the one hand up so that it could give the peace sign. Step 5: Stuff your torso into the back pack. I had to add a pillow to the bottom of my back pack so that the torso stood high enough over my daughter’s head to look realistic. The stuffing of the torso into the back pack is kind of a pain because it is all just a little unwieldy. I ended up wrapping duct tape around everything to make sure nothing fell out. Also, think before you stuff. There is a proper way for the front of your torso to be facing. I put the torso in the wrong way at first, so the front of the torso was facing backwards. You’ll either do it right the first time and have no idea what I’m talking about, or you’ll mess it up like I did and totally get what I just said. Step 6: Stuff each glove with another grocery bag. I then hot glued my glove fingers into a peace sign. Step 7: Add your next layers. My next layers were the floral shirt and the long black skirt. If you’re going with the button down long jacket, then you don’t really need a third layer. Let me explain. My floral shirt didn’t cover the back pack, so I needed the flowy skirt to complete the ensemble, but also to cover the back pack. Step 8: Put the back pack on. I then buttoned the floral shirt so that my daughters head was sticking out around the middle of the shirt. Then I added the flowy skirt, up to and OVER my daughters arms AND the back pack so that they were all hidden. If you’re going with the lab coat look, you’ll put that on now, too. Ok that was way harder to explain than it was to actually do. It was so worth the effort. In total it took about an hour to make and I really did have all of that stuff in the house. The skirt is mine from the summer and the floral shirt is a long story, but it’s my husbands. The reactions she got at the Halloween party were priceless! She had two people ask to take her picture for the paper. It was definitely a hit!